If there’s any one thing that defines this issue, its the familial relationship between the Rogues. They started out as regular criminals with fancy themed weapons, but then became “themed” supervillains and have suffered several ups and downs over the years. However, through it all, they’ve managed to stick together. They are still a unit, a family even. That’s what I loved so much about the issue, what I really liked to see explored. I’m not familiar with any of these villains outside of brief appearances in Justice League: The Animated Series, so I don’t really know anything about them other than their supervillain monikers. What Brian Buccellato does here is that he shows them as supervillains, but supervillains with a code of honour, supervillains with morals, with limits to their violence. They aren’t manipulative jerks like Lex Luthor or crazy off-their-head-lunatics like the Joker or vicious animals like Cheetah or cold and calculating like Darkseid. These are villains you can truly sympathise with, villains you truly can understand enough to like them for who they are beyond being villains. We get to see (very briefly) the origins of the Rogues as supervillains. We get to see them as they are in the present time as they try to break out one of their own, Trickster, from the Iron Heights Penitentiary. We get to see them at one of their most defining moments, when they decide not to kill innocents while carrying out an elaborate bank robbery. We see a lot of humanizing of the Rogues, and that’s what really worked for me. With all the other supervillains, they’ve all lacked that personal touch for the most part. They all fall on a spectrum that lies between evil and terrifyingly evil. The ending, which follows on from a scene sequence first see in Forever Evil #1 by Geoff Johns, was spectacular. It introduced a completely new plot point, something that will carry over into next month’s Forever Evil: Rogues Rebellion mini-series, to be written by Brian and drawn by Patrick Zircher, the same core duo that has worked on this issue as well. Which brings me to the art. Patrick’s style, combined with colourist Nick Filardi’s colour choices, is a different style to what I’ve seen so far on the entire series, and it is just as exceptional and fitting as all of them. There’s a certain stylistic flair to their work that really fits the mood and tone of Brian’s script, that connects it all together into a really enticing package. The art is darker and moodier than any of the other The Flash Villain’s Month titles, which was really interesting for me since the script itself isn’t so dark, but there is a lot of groundwork for future plotlines being laid here, and in that context, it all works. I certainly enjoyed it. 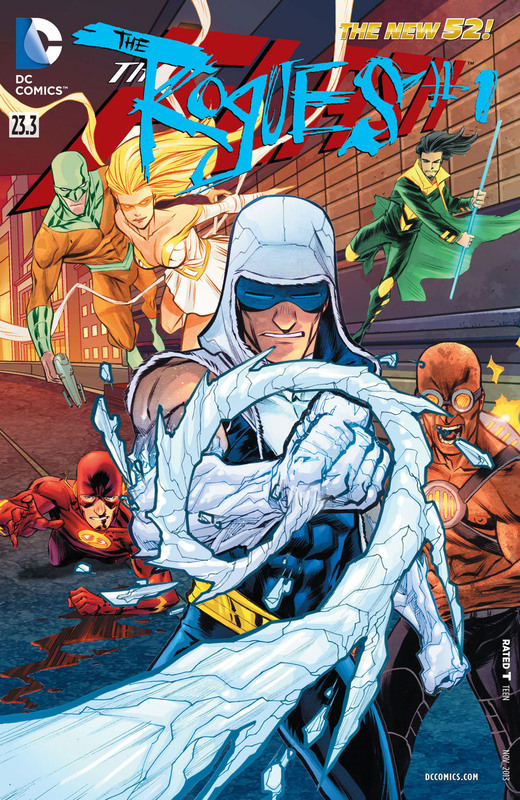 Ultimately, even though the issue is all largely from Captain Cold’s perspective, we see great glimpses of characterisations for the other Rogues, especially Weather Wizard, Heatwave and Glider. It made for some great reading. Patrick and Nick’s art made for some stimulating visuals as well. So, as a result, this issue is definitely one of the most memorable issues of Villain’s Month so far. I loved it. And I highly encourage you to check it out. More The Flash: Annual #2, #23.1. Posted on September 23, 2013, in 2013 Reading Challenge, 2013 Writing Challenge, Challenges, Comics Reviews, Review Central and tagged 2013 Reading Challenge, 2013 Writing Challenge, Brian Buccellato, Captain Cold, Challenges, Comics, Comics Reviews, Forever Evil, Glider, Heatwave, Mirror Master, New 52, Nick Filardi, Patrick Zircher, Review, Review Central, Rogues, The Flash, Villain's Month, Weather Wizard. Bookmark the permalink. 7 Comments.